Do you ever find yourself day-dreaming about your next holiday, only to be interrupted with a cry of, “What’s for dinner, darl”? That’s exactly where the DreamPot has the answer. This thermal cooking dream comes with so many great recipes and ideas, you simply follow the instructions and there is no chance of burning the food. Like to know more? Then read on! When you think of thermal, your thoughts may drift to those wonderful heart-warming natural springs you bathe in while sipping a cocktail or two. While that all sounds very appealing, that’s not quite what we’re talking about here. Simply put, this cooking style is all about using a device (the DreamPot) which uses thermal insulation for retaining heat and cooking food. Following the recipe, you only need to put the ingredients into the supplied pot, then place the pot onto any heat source to begin the cooking process for the time stated on the recipe. Once the timing is complete, transfer the pot into the DreamPot, close its lid, and let it continue to cook until your meal completes the minimum cooking time. No stirring, no checking, and no fuss. Sound easy? You bet. 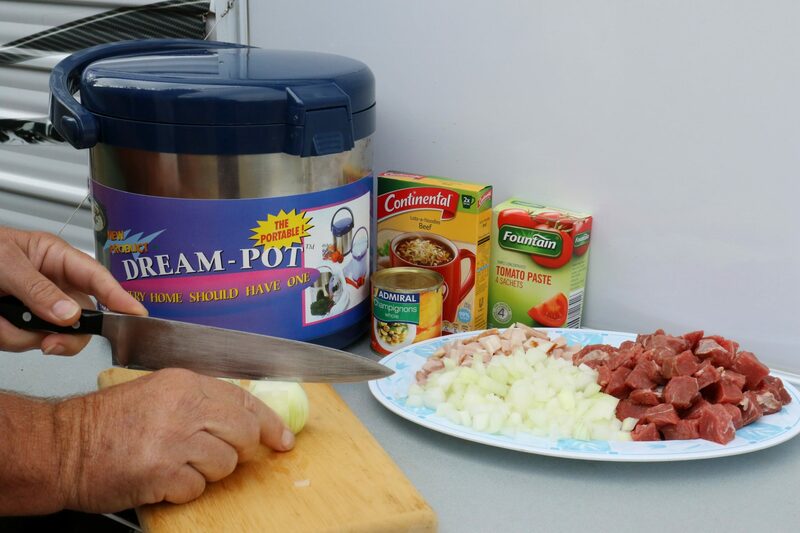 DreamPots come in a range of sizes which contain stainless steel pots with heavy sandwich bases that conduct and hold heat well. The 3 litre contains one pot (suits 1-2 people), the 5 litre contains two pots for cooking two meals simultaneously (suits 2-4 people), and a 6 litre big daddy which also contains two pots (suits 2-4 people). As you develop your culinary skills, you may like to expand your repertoire by adding accessories such as the egg poacher, steamer and bread tins which are all sold separately. While we found more than one thermal style cooking device on the market when we made our purchase, the DreamPot comes with good DNA. It’s an Australian family-owned business that’s been operating since the mid 60’s, and we find the recipes continue to be refined today, with new ones constantly being added via their recipe books and free monthly online newsletter. If you’ve ever been to a caravan show and seen people gathered around a cooking demonstration, no doubt you’ve smelt those wonderful aromas that make your mouth water, and either wandered over to see what it was all about, or moved on thinking it was a fly by night gimmick. Well, that happened to us some 6 years ago, but we stopped to check out what the DreamPot was all about, and walked away with a 5 litre model under our arms – and we haven’t looked back. 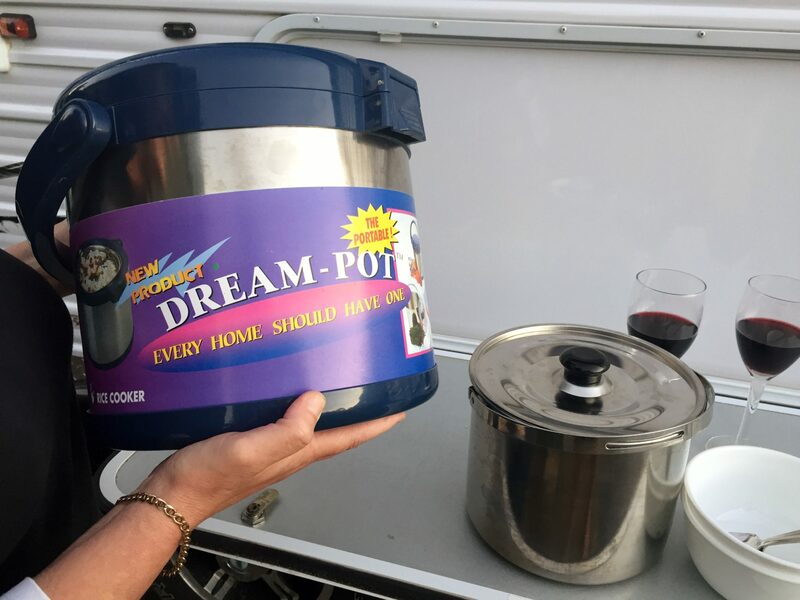 When we bought our DreamPot, we didn’t just pick up something that was good for preparing one pot wonders, as it’s actually six appliances in one. Not only is it a thermal cooker, but it’s a bread maker, rice cooker, bain marie, and can also be used as an ice cooler and a yoghurt maker. There can’t be too many other products on the market that can do all that. The DreamPot’s insulating properties make it the perfect travelling companion as it saves us stacks of meal preparation time. We only need to prepare the ingredients and get the meal going, and it will be ready for us to eat as the sun goes down. We’ve even used it as a cooler for a few tinnies when we’re having a day out on the water. The DreamPot’s versatility makes it a huge drawcard for us, and its superior insulation, robustness and stability, means it’s perfectly designed for travelling. We love it that much that it’s one bit of gear that we even use at home because it’s here you can refine your skills, and you can become a real travelling masterchef when you’re on the road. 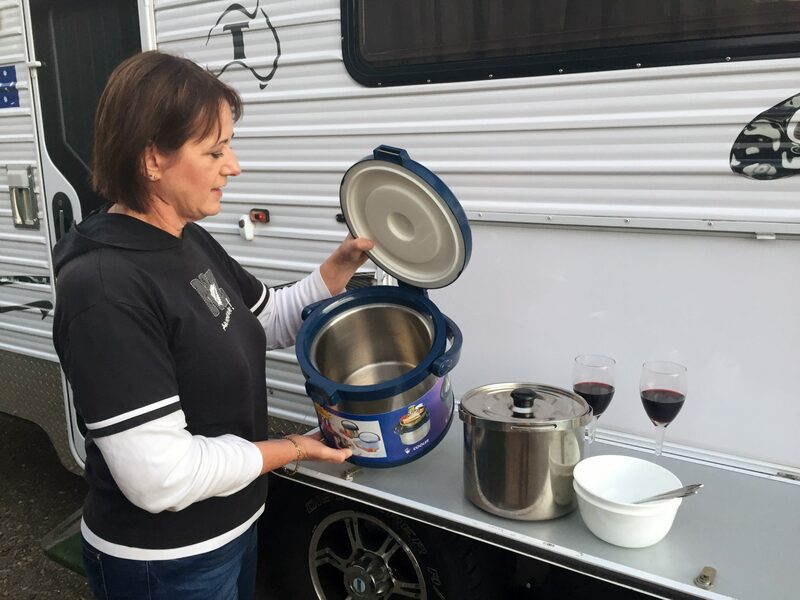 We have a number of favourite recipes we use while travelling, so that when we’ve stopped for the day and ready to chow down, it’s simply a case of re-filling the wine glasses and grabbing a couple of serving bowls, crack open the DreamPot’s lid, give it a quick stir, and serve. Too easy! Even after all these years, this is still an item that gets a regular work out whether we’re on the road or not, which I think comes down to its simplicity and versatility – and I don’t think that will change any time soon. Oh, I forgot to mention that tonight’s dinner is a DreamPot Beef & Red Wine Casserole with some rice and a glass or two of red. Cheers!